Pep Band: Noisy, But In A Good Way! As basketball season is beginning, the high school pep band is hard at work. They practiced hard to be ready for the first home game, which was on December 13th. Performing the National Anthem, playing warm up songs before tipoff, and being the halftime entertainment is very important to the pep band squad. “Loud noises! 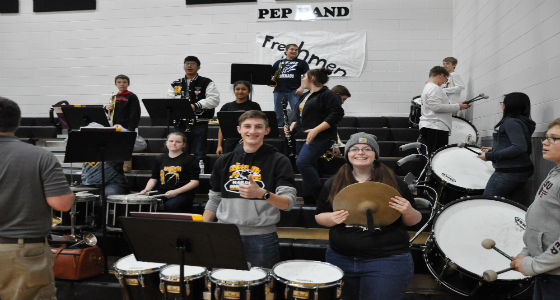 The pep band, who performs at all of the Varsity boys basketball games, plays upbeat music to rally the crowd and support our team!” Brian Reeves, HN’s band director, said. “Pep band is a great time. You can play great music and hang out with great people. In this last year, I am going to play my best and encourage others to do the same,” Samuel Diller said. This is Diller’s last hurrah, along with many other seniors in the pep band, so he wants to make it his best year yet!